A Certificate of Incorporation, a photocopy – April 11, 1914 was found in the Record Book stating that the Registrar of Joint Stock Companies states: I hereby certify that GREEK ORTHDOX ROMANI BISERICA INALTAREA SFINTII CRUCI OF P.O. SHEPENITZ IN ALBERTA, CANADA, is this day incorporated under Chapter 38 of The Consolidated Ordinances of the North – West Territories of 1898, as amended by Chapter 22 of the Statutes of Alberta, 1907. The Ordinance was given, signed and sealed at EDMONTON on 11th day of April, 1914 by Registrar, P.L. McNamara, and E. Crowbridge, Deputy Provincial Secretary. The Ordinance respected the Holding of Lands in Trust for Religious Societies and Congregation. Title issued covers 3.037 acres in the N.E. ¼ Section 10 – 56 – 13 W. of 4th which is to be used for Church purposes exclusively, and entrusted to the Trustees of the Greek Orthodox Church. The Church belong to the Greek Orthodox Romanian Denomination. Rules and Regulation were set up at the first meeting March 3, 1914 for the Congregation. 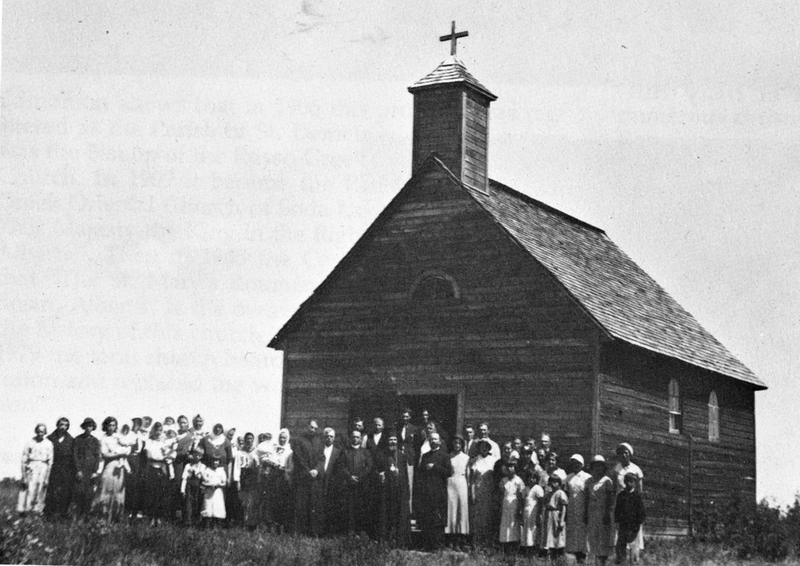 The Trustees (Board) had the right and privilege to do all what they deem useful and necessary for the management of their Church, to carry on the missionary work among the Romanian people, to carry on the missionary work among the Romanian people, to organize societies and to establish schools and libraries. Rules were in place for the conduct of the members, officers, and properties of the Church The Rules were spelled out for the Chairman, Secretary, Treasurers, and the governing and conduct of all the Church members, what they could be expelled for and re – installed. An allegiance of oath was also taken, most importantly for the early executive and members. Disorderly members who act contrary to the rules and regulation may be excluded from the said church by striking out their names from the said church by striking out their names from the list at the general meeting and their dues shall be forfeited. Two cardinal principles were to be adhered to: (1) Any member of the Board of Trustees who willfully neglect to carry out the orders and instructions of the members of this congregation given by resolution at the general meeting or who may misuse or mismanage the property of the Congregation entrusted to him, he shall be liable of an offense and fined with not less than $5.00 and no more $50.00. (2) The Board of Trustees to have the right and privilege at their ordinary meeting to do all what they deem necessary and useful for the management of their church, but in matters pertaining to real estate of the Congregation, the general meeting has to be called and the members to decide by resolution.